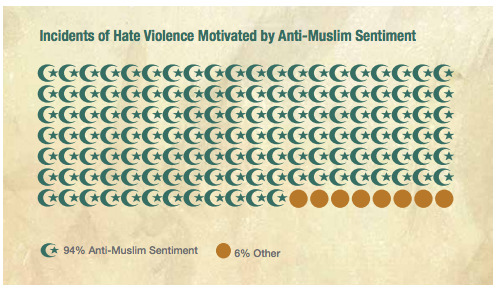 140 incidents of hate violence of which 94% were influenced from anti-Muslim sentiment. The South Asian Americans Leading Together published a report on Wednesday documenting hate violence against South Asian, Arab, Middle Eastern, Sikh, Hindu and Muslim communities from November 2015 to November 2016. SAALT reported 207 instances of hate violence and xenophobic political rhetoric — an alarming 34% increase within less than one-third of the time covered in their 2011-2014 report Under Suspicion, Under Attack. • 140 incidents of hate violence of which 94% were influenced by anti-Muslim sentiment. • 67 instances of xenophobic political rhetoric used by key political figures and presidential candidates; 1 in 5 of these documented comments were by President-elect Donald Trump. • 96% of all incidents of xenophobic political rhetoric were motivated by anti-Muslim sentiment. • total of 196 incidents, or 95%, of all documented hate violence and xenophobic political rhetoric were motivated by anti-Muslim sentiment. Suman Raghunathan, SAALT’s executive director, said that while there have been unfortunate — and very limited — incidents of hate crime reports that turned out found to be false, the vast majority of hate crimes go unreported and unseen. Raghunathan said there has been an alarming increase of hate violence targeting South Asian and Muslim communities. “Based on our data and analysis, what we’ve seen was a steady troubling drumbeat that only continues to intensify with the respect the hostility and violence put on our communities on a daily basis,” Raghunathan said by phone. 67 instances of xenophobic political rhetoric used by key political figures and presidential candidates. When asked if all 207 incidents of hate violence were verified by SAALT, Raghunathan said they were all verified largely — almost overwhelmingly — from media and news reports. She noted that there is a compelling hunch, from monitoring their crowdsourced database, that the number of hate violence incidents targeting the South Asian and Muslim community are severely underreported. Incidents of hate violence targeting South Asian, Muslim, Sikh, Arab, Hindu and Middle Eastern communities nationwide from November 2015 to November 2016. Raghunathan said with communities of color rapidly growing and the South Asian community becoming one of the fastest growing demographics in the U.S., it’s imperative to re-examine the national conversation around race and religion.